As comes with the territory of being a Super Bowl champion, both Tom Brady and Julian Edelman, the game’s MVP, were in Disney World on Monday, parading around the Magic Kingdom in celebration after winning the big game the night before. OH COME AHHHHNN, TAAAHHHMMM. Can’t you just enjoy this for one freakin’ second??!! We get it. You have the determination and work ethic of a coal miner in the 1800s. Your meticulous diet is enough to make even Richard Simmons blush. You’ve taken hundreds of hits – both on the field and off – over the past 20-plus years of football, and you STILL want to play for another 20 more. It amazes everyone how you are still so driven, on such a visceral level, by some incessant Napoleonic complex that comes from being a sixth-round draft choice almost 19 years ago. You’re also the only NFL player in history with six titles to his name. You’ve literally won more games than ANYONE else in the history of EVER. There will simply never be another Thomas Edward Patrick Brady Jr. Period. And, I don’t know, maybe that’s why people can’t really say anything other than the fact that you’re the best that’s ever played. As much as people still want to hate you out of spite, at this point I don’t even think the most ardent Brady-haters out there would dare try to dispute that. Look, I know this is just typical “athlete talk” and Brady would get eviscerated in the media if he instead responded to Strahan with a “YOU DAAAAAMN RIGHT, I AM.” But still. So, come on, Tom. You’re not fooling anyone. You are the GREATEST OF ALL TIME. I know it. You know it. The world knows it. But still, don’t lose that drive, though, old man. I wouldn’t mind another one or two before you ride off into the sunset. 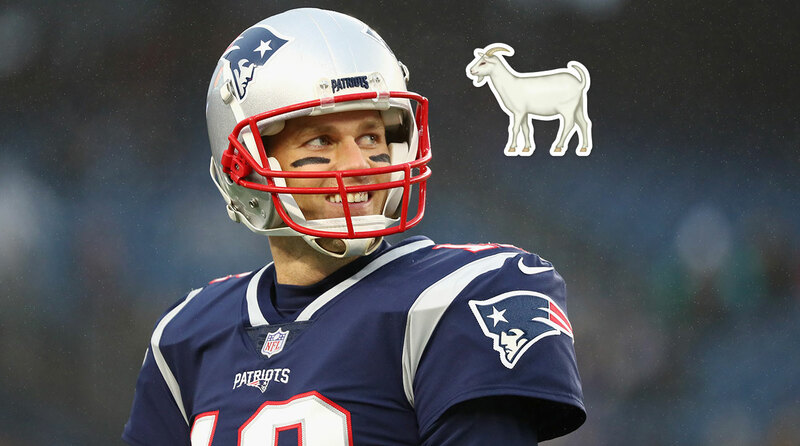 This entry was posted in NFL, Patriots and tagged brady, Brady G.O.A.T., Brady GOAT, New England Patriots, Patriots, Pats, Super Bowl LIII, Tom Brady, Tom Brady GOAT. Bookmark the permalink.